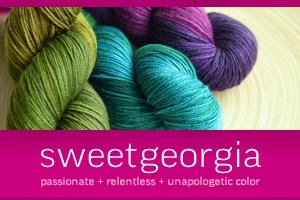 We've got lots of posts to get write before this year's Yarn Crawl is here and happily for today's post, we can say that SweetGeorgia Yarns is back as a sponsor again this year. If you've seen the bright, pink SweetGeorgia banner at either Unravel or Unwind Brighton this year, you know that it means that's where you can find the bold, passionate colour of this beautiful, hand-dyed yarn from Vancouver, Canada. 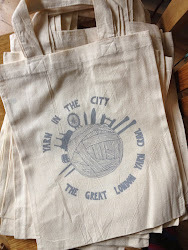 They've been busy this year promoting their UK stockists and making sure folks know they can get their yarns here in the UK. One of the newest SweetGeorgia colours - Sapphire - was used for the Rhaeadr shawl in the latest Knitty. The colours that Felicia Lo and her team develop and dye are heavily saturated, gorgeous pops of big colour. Their semi-solids are their most popular, and shimmer with subtle shifts of colour that keep the eyes interest on your knits! Not that the variegated colours aren't gorgeous too - we love them all! 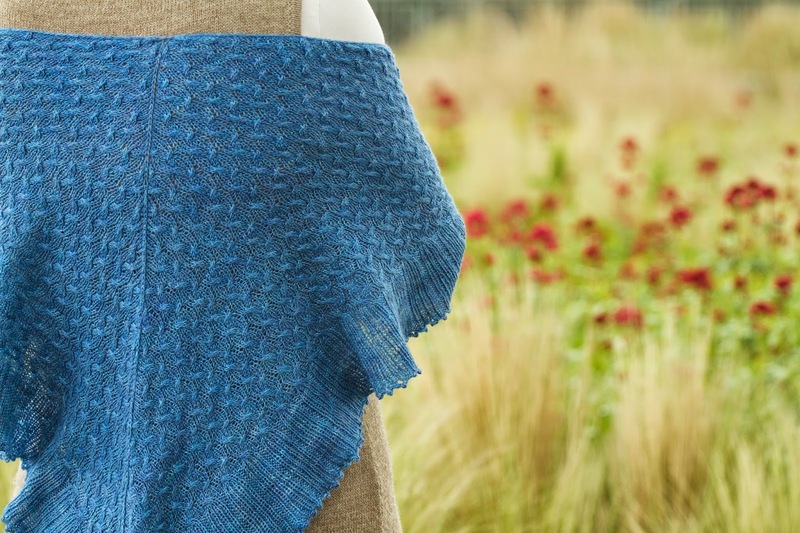 Baya by Mindy Wilkes is a stunning shawl! 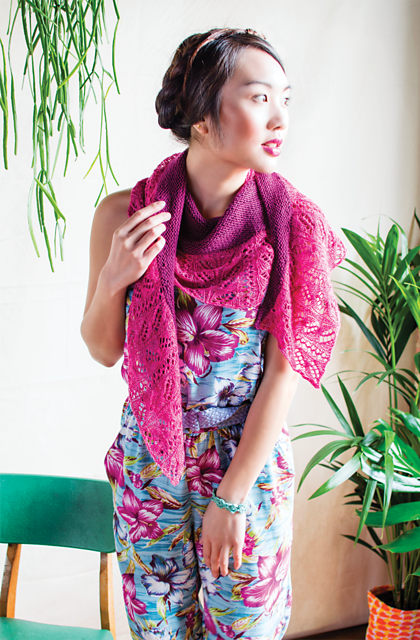 The playful, two-tone Baya shawl designed by Mindy Wilkes on the cover of Pom Pom Quarterly's summer issue uses two skeins of SweetGeorgia fabulousness. Felicia put together some terrific colour combinations of the Baya shawl as kits for Unwind Brighton and we were lucky to snag one for our GLYC door prizes before they were all gone! The kit features a skein of Tough Love Sock in Ultraviolet, with the contrast lace a skein of CashSilk Lace in Wisteria that feels like a little cloud. It's going to make a gorgeous shawl - or whatever the lucky winner wants to knit with it! 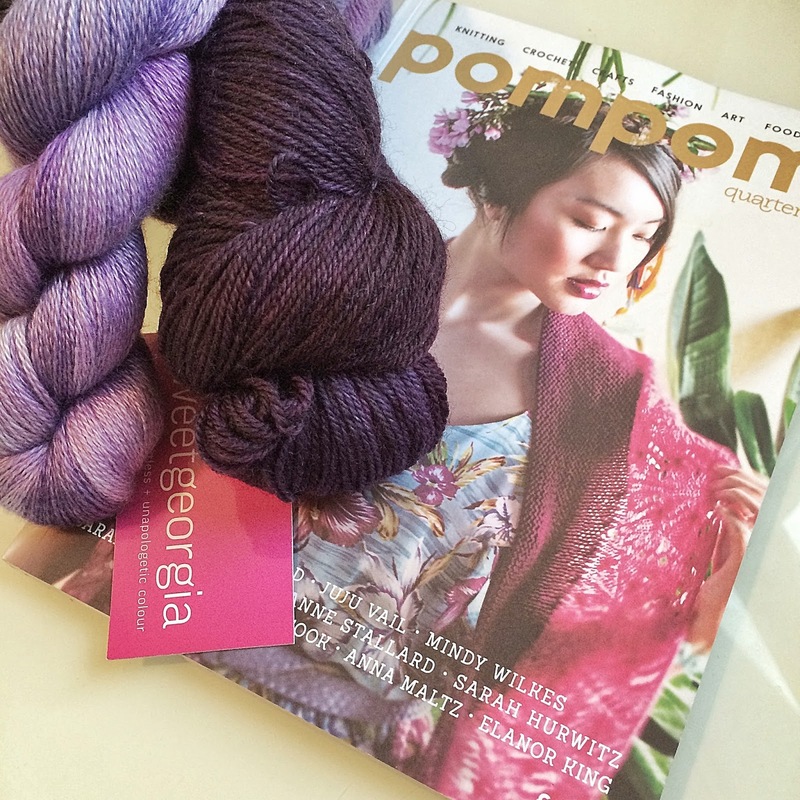 If the lucky winner doesn't already have the spring issue of Pom Pom to make the shawl, those nice PPQ gals will make sure that they get a copy so they can knit this wonderful shawl! And for extra good measure, the lovely SweetGeorgia team has also donated a skein of their soft and bouncy Superwash Worsted in Hush, that we'll be popping into the extra special gift basket to be raffled off at the after party. Thank you SweetGeorgia and Felicia! We'll have more details about the gift basket in a special blog post this weekend, and how you can get your tickets. Stay tuned!